Kaya Varuthathu / Kerala Banana Chips is an integral part of the traditional Kerala meal called sadya. but the Banana Chips served at Kerala sadya / meal is usually not cut into big circles like it but quartered into smaller pieces and they may be thicker than it. These delicious crunchy snacks are very popular in Kerala. This amazing natural fresh Banana Chips can make easily in home. 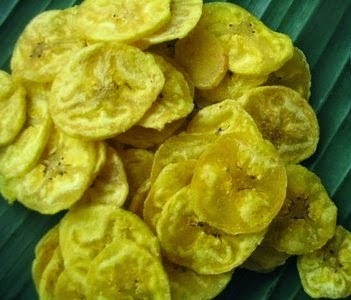 Unripe banana are used to make this chips. Good Slicer slices quite thin tasty and crispy chips. Salt : Add as per your taste. 1. Take 4 nos Unripe banana / Plantain / Ethakka / Nenthra Kaya. 2. Cut top and bottom of banana and make knife into the skin of the banana and peel off gently. 3. Take a bowl and mix the turmeric powder with little water and immerse the peeled banana in it for 2 minutes. 4. Take a Slicer and slice the unripe banana into a bowl. 5. Mix salt in 1/2 cup of water and set aside. 6. Heat oil in a heavy bottom pan in a high flame. When it reach almost high heat reduce to medium flame and put the sliced banana by hand one by one very quickly. The chips will sizzle and then stir it. When it get start light brown and sizzling will almost stop, the chips are ready. At that time springle the salt water over the chips carefully.Stir well and then drain the chips to a bowl. Now Kerala traditional banana chips are ready. Using the Slicer slice the banana and put it in the turmeric water for 2 minutes and dry it under the fan and frying the chips will make more tasty. Using the Slicer, slice the banana and directly do this into the hot oil is a easy step but the taste differs. Store banana chips in a airtight container. Coconut oil may get rancid quickly so that please use the chips fresh.